The wonderful People of Walmart website collects photos of the wackiest customers across the country -- and Missouri appears to be a goldmine. In honor of Michelle Obama's visit to Springfield's Walmart tomorrow, we thought we'd collect the best and worst from the People of Walmart -- a sneak peek of some of the characters the First Lady could perhaps encounter on her Missouri trip. For your viewing pleasure/horror -- the top sixteen standout Missourians of Walmart below. Gives new meaning to the Show-Me State. Forget the baby bump, just bring an actual baby! Or if you don't have that, a baby doll will do just fine. So take off your shirt. We won't judge. 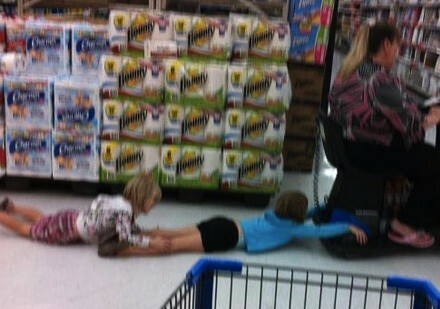 Continue for more of our Missouri People of Walmart countdown.